"Exploring Ethnobiology II: Nancy Turner"
In May 2010, Deconstructing Dinner travelled to Vancouver Island where two international conferences on ethnobiology were being hosted. Ethnobiology examines the relationships between humans and their surrounding plants, animals and ecosystems. Today, more and more people are expressing an interest to develop closer relationships with the earth. This leaves much to be learned from the research of ethnobiologists, and in particular, from the symbiotic human-earth relationships that so many peoples around the world have long maintained. On this part II of the series, we listen to segments from a one-on-one interview with Nancy Turner of the University of Victoria. Nancy is one of the most well-known ethnobiologists in Canada and Deconstructing Dinner's Jon Steinman sat down with her in the community of Tofino to learn more about what ethnobiology is, why the field is an increasingly important one to pay attention to, and what we all might learn from the many indigenous peoples who ethnobiologists work with. Also on the show - a recording of a presentation by Cheryl Bryce and Pamela Tudge who are examining how the indigenous peoples living in what is now the City of Victoria might reinstate traditional harvesting practices of an important traditional food - camus. Nancy Turner, distinguished professor, School of Environmental Studies, University of Victoria (Victoria, BC) - Born in Berkeley, California, Nancy moved to Victoria at the age of 5 and she lives there today as a Distinguished Professor in the School of Environmental Studies at the University of Victoria. She earned a PhD in Ethnobotany in 1974 from the University of British Columbia when she studied three contemporary indigenous groups of the Pacific Northwest (the Haida, Bella Coola and Lillooet). Nancy's major research has demonstrated the role of plant resources in past and present aboriginal cultures and languages as being an integral component of traditional knowledge systems. Nancy has also played an important role in helping demonstrate how traditional management of plant resources has shaped the landscapes and habitats of western Canada. In 1999 Nancy received the Order of British Columbia and in 2009 received the Order of Canada. She's authored numerous books including, among others, Food Plants of Coastal First Peoples, Food Plants of Interior First Peoples, Plants of Haida Gwaii and The Earth's Blanket - Traditional Teachings for Sustainable Living. Cheryl Bryce, lands manager, Songhees Nation, (Victoria, BC) - The Songhees or Songish, also known as the Lekwungen or Lekungen, are an indigenous North American Coast Salish people who reside on southeastern Vancouver Island, British Columbia in the Greater Victoria area. Pamela Tudge, former student, School of Environmental Studies, University of Victoria (Victoria, BC) - Pamela recently moved to the North Okanagan region of BC where she's now studying food systems and mapping for her master's research at the University of British Columbia - Okanagan. NEW - Genetically Engineered Honey? Honey – one of the most natural foods. In the supermarket, honey is found labelled as coming from clover, buckwheat, alfalfa or maybe orange blossom. The label might just read ‘honey’ without any indication of its source of nectar. But is the nectar source even important to those of us wishing to become more conscientious eaters? As Deconstructing Dinner has discovered, there is a curiosity surrounding honey – a curiosity, which has rarely, if ever, been spoken…. until now! It turns out, in Canada, 80% of all the honey produced in the country is from the nectar of canola – yet, nowhere on the grocery store shelves do we ever see honey labelled as “canola honey”. And so the question becomes – just where is all that canola honey ending up? NEW - How Organic is an 'Organic' Egg? 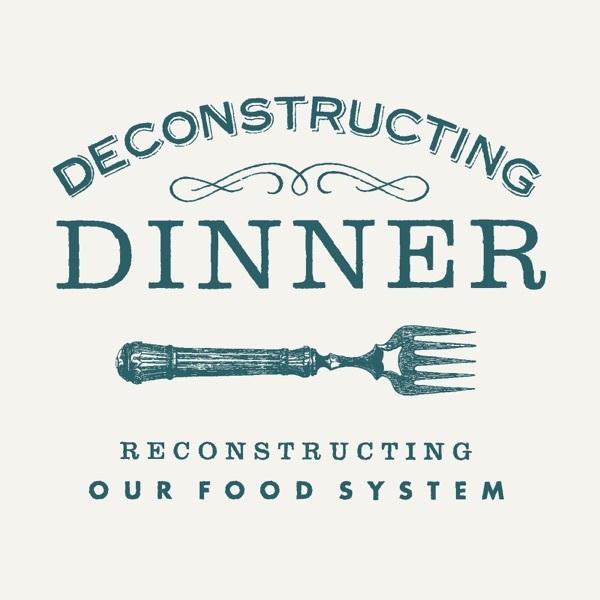 Deconstructing Dinner's Jon Steinman sits down with Mark Kastel - the co-founder of the Cornucopia Institute - a populist farm policy research group based in Wisconsin. Mark and Jon discuss the changing face of organic food. Using eggs as an example - Mark explains how eaters can exercise a more discriminating awareness when purchasing 'organic' eggs. It's not uncommon for most of us eaters to view the system supplying us with food as being separate from us, but on this podcast, one of Canada's most recognized food policy analysts offers his perspectives which suggest otherwise. Instead, the food system has in many ways been designed to satisfy the demands that we make every day to eat the same food, year-round, regardless of season, geography or climate. It seems that we eaters, have become so accustomed to that fresh tomato slice on our sandwich, that glass of orange juice in the morning, or that salad of fresh greens, that these very demands have shaped the food system, and, subsequently, shaped the world we live in. But are these demands for a perpetual harvest necessary? Could we do just fine or even better by choosing a more seasonal approach to eating?...., and, if so, could this way of eating reconstruct the food system for the better? On this all-new podcast, Deconstructing Dinner's Jon Steinman examines some of the key differences between conventional and organically produced wheat. This episode #193 marks the final broadcast of Deconstructing Dinner before we embark on a much-needed break. Producer & Host Jon Steinman speaks about the need to step away from producing new shows and what future might lie ahead. Jon also shares some reflections on the past 5 years of producing this weekly one-hour radio show and podcast, and offers suggestions to those involved in the responsible food movement - a movement which this show has helped track its evolution and certainly one that this show has in many ways been a part of. Also on the show - a brief update (regrettably brief!) on our September undercover investigation on a B.C. egg business who had been fraudulently marketing their product as being from their own farm when in fact the property on which the business operated was not a farm at all! It appears the Canadian Food Inspection Agency has vowed silence instead of transparency. "The Local Grain Revolution XII (Year 3 & Lopez Island Grain Project)"
Since March 2008, Deconstructing Dinner has been tracking the evolution of the Kootenay Grain CSA (Community Supported Agriculture) in the interior of British Columbia. The project is Canada's first community supported agriculture project for grain and it's been quite a while since we've checked in with how it's evolved throughout it's third year. Also on this part 12 of the series, we learn about the many grain projects underway elsewhere in Canada and the United States, all of which have been inspired by this very Local Grain Revolution series! Specifically, we travel to Lopez Island, Washington, where one of those projects has completed its first successful year. In October 2010, Jon Steinman visited the Island to share the story of the Kootenay Grain CSA and learn about the Island's very own. Roy Lawrence, farmer, R&S Lawrence Farm (Creston, BC) - Roy is a third-generation farmer. Prior to the CSA, Roy had farmed using conventional methods but the CSA became an opportunity for him to transition to growing naturally. Joanne Gailius, farmer, Full Circle Farm (Canyon, BC) - Full Circle Farm began in Black Creek, a Mennonite community on Vancouver Island. The Gailius family gardens and raises chickens, turkeys, cows, fruit trees and Norwegian Fjord horses (which are used as labour on the farm). In 1999, the family moved to the Creston Valley where they now farm on 40 acres. "Exploring Ethnobiology IV (The Immaterial Components of Food Sovereignty / Comparing 17th/18th Century Cereal Grain Productivity Among Iroquois and Europeans)"
Exploring Ethnobiology is a new series Deconstructing Dinner has been airing since June. Through a scientific lens, ethnobiology examines the relationships between humans and their surrounding plants, animals and ecosystems. With seemingly more and more people becoming interested in developing closer relationships with our surroundings (our food, the earth), there's much we can all learn from ethnobiologists, and in particular, from the symbiotic human-earth relationships that so many peoples around the world have long maintained. Food sovereignty is also a subject that permeates much of what airs on Deconstructing Dinner, and similarly permeates much of the dialogue among ethnobiologists. At the 2010 International Congress of Ethnobiology held in Tofino, B.C., a group of ethnobiologists gathered to discuss food sovereignty with a focus on the immaterial or intangible components of food sovereignty. In the first half of the episode, we listen in on some of that discussion and in the second half, we listen to Associate Professor at Cornell University's Department of Horticulture, Jane Mt. Pleasant, whose research has involved a fascinating comparative look into 17th/18th century cereal grain farming between the Iroquois people of what is now upstate New York and early European colonizers. Her research paints a telling picture of just how much our western food system is built upon a propensity to maintain the status quo instead of adapting to our surroundings and working in closer relationship with the land on which we grow our food. Lewis Williams, Feasting for Change (Tsawout First Nation near Saanichton, B.C.) - The Tsawout First Nation is one of five bands that make up the Saanich Nation and is located north of Victoria, B.C. near the community of Saanichton. Lewis is involved in Feasting for Change - a project that looks to preserve traditional indigenous foodways on Vancouver Island. Linda Different Cloud, ethnobotanist / restoration ecologist, Sitting Bull College (Standing Rock Lakota Nation, ND/SD) - Linda is an ethnobotanist and restoration ecologist of the Standing Rock Lakota Nation in what is now North and South Dakota. Jane Mt. Pleasant, associate professor, Department of Horticulture, Cornell University (Ithaca, NY) - In addition to serving as an associate professor in the Department of Horticulture, Jane is also director of the American Indian Program at Cornell University, with research and teaching responsibilities in both units. Her research focuses on indigenous cropping systems and plants and human well being. She lectures frequently on indigenous agriculture and its links to contemporary agricultural sustainability, and am considered a national expert in Iroquois agriculture. "TED Talks on Food w/Jamie Oliver, Carolyn Steel & Christien Meindertsma"
TED has become an incredibly popular series of conferences featuring inspiring speakers from around the world. TED is a small non-profit devoted to what they call - "Ideas Worth Spreading." Starting out in 1984 as a conference bringing together people from three worlds: Technology, Entertainment & Design, TED has since broadened its scope to include two annual conferences in California, a global conference in the UK and many on-line resources where more than 700 TEDTalks are now available. TED believes in the power of ideas to change attitudes, lives and ultimately, the world. With a number of the talks delivered at their annual conferences involving food, on this episode, we hear three of those talks including one delivered by well-known television personality Jamie Oliver who speaks passionately about teaching children about food. We hear architect and author Carolyn Steel speaking about the history of how cities fed themselves and we hear author/artist Christien Meindertsma speak about the astonishing afterlife of the ordinay pig, parts of which make their way into at least 185 non-pork products! Jamie Oliver, chef/author, JamieOliver.com (London/Essex, UK) - Jamie Oliver has been drawn to the kitchen since he was a child working in his father's pub-restaurant. As the host of the BBC2 television show Naked Chef launched in the late 90s, Jamie Oliver has built a worldwide network of TV shows, books, cookware and magazines, all based on a formula of simple food. Today, Jamie's focus has been on bringing attention to the changes he believes are needed to the diets of Brits and Americans and has launched campaigns such as Jamie's School Dinner, Ministry of Food and Food Revolution USA. Carolyn Steel, architect/author, Hungry City - (London, UK) Carolyn uses food as a medium to read cities and understand how they work. In her book Hungry City, she traces and puts into historical context food's journey from land to urban table and thence to sewer. Christien Meindertsma, author/artist, PIG 05049 (Rotterdam, Netherlands) - Christien is a dutch artist who explores raw materials in thoughtful ways, making simple books and products to better showcase once-hidden processes. Her second book, titled PIG 05049, documents the astounding array of products that different parts of a pig named 05049 could support -- revealing the lines that link raw materials with producers, products and consumers that have become so invisible in an increasingly globalized world. PIG 05049 was acquired by New York's Museum of Modern Art this past winter. Bucky Buckaw - host, Bucky Buckaw's Backyard Chicken Broadcast (New York, NY) - Bucky Buckaw gives advice on raising backyard chickens as just one example of how a locally based economy can work. Through this segment, he informs listeners about the downside of factory farming and what kinds of toxic chemicals you can expect to find in the resultant livestock. He promotes organic gardening and composting, and supporting local farmers. "Packaged Foods Exposed V (Unilever 3 Years Later) / Unequal Harvest"
Deconstructing Dinner revisits with our popular series - Packaged Foods Exposed. Launched in 2006, the series examines the largest manufacturers of processed foods in the country and takes an often overlooked and critical perspective of these powerful companies. When Deconstructing Dinner last aired this series, we featured a two-part exposé of Unilever. With three years having now transpired since those episodes, it appears that the company is in much need of some more deconstructing! Needing particular attention are Unilever's questionable marketing strategies. Following our research that has gone into this episode, four complaints were filed with the Canadian Food Inspection Agency. Deconstructing Dinner now awaits their response. Deconstructing Dinner visits with the excellent theatrical performance, Unequal Harvest - a series of monologues written by Winnipeg's Geoff Hughes. Unequal Harvest examines some of the root causes of hunger and food injustice taking place around the world. Nicole Shaw, publisher/editor Synergy Magazine (Lantzville, BC) - Nicole Shaw launched Synergy Magazine in March of 2004 after receiving much encouragement and support from members of the community. Nicole's background includes ten years in the computer industry, four years of freelance graphic design, ad layout with the Link Newspaper, four years of PR work and much interest in personal growth and energy healing work. Nicole is the co-host of Heart and Mind: Tools for Change - a radio talk show on CHLY Nanaimo. She and partner Dirk Becker farm organic vegetables. Kami Desilets & Brent Hirose, actors Unequal Harvest (Winnipeg, MB) - Winnipeg playwright Geoff Hughes has brought food injustice to the stage. In 2008, three non-profit organizations; The Canadian Foodgrains Bank, the Manitoba Food Charter and Winnipeg Harvest resolved to draw attention to the Global Food Crisis by commissioning Geoff to write and direct the original work Unequal Harvest. Debuting in Winnipeg on World Food Day in 2008, the play continues to be performed across Canada including its latest stop at the 2010 Victoria Fringe Festival. "Exploring Ethnobiology III / Investigating Eggs Update"
On this part III of the series, we listen to two presentations that share research into the relationships between indigenous peoples and marine life in what is now called British Columbia and Alaska. Also on the show - an update from the Canadian Food Inspection Agency to our September 2 investigative report on alleged local food fraud. Severn Cullis-Suzuki, masters in ethnobotany, School of Environmental Studies, University of Victoria (Haida Gwaii, BC) - Similar to her father David Suzuki, Severn has devoted herself to increasing awareness on fundamental ecological concerns. Born and raised in Vancouver, at the age of 9, Severn founded the Environmental Childrens Organization. In 1992 at the age of 12, she attended the Earth Summit in Rio de Janeiro where she received praise for a speech she delivered. She went on to graduate from Yale Univeristy in 2002, hosted a television series on Discovery Channel, and was eventually led to study ethnobotany under Nancy Turner. Her focus of research led her to Northern Vancouver Island - home to the Kwakwaka-wakw people. It was there that Severn studied the keystone species Zostera marina - also known as eelgrass - or to the Kwakwaka-wakw (ts'ats'ayem). Josh Wisniewski, PhD candidate, Department of Anthropology, University of Alaska Fairbanks (Fairbanks, AK) - Josh received his BA and MA in anthropology from the University of Alaska Anchorage. His research explores the complex sets of relations between Iñupiaq and Yup'ik societies and marine mammals through time and the ontological premises shaping local and traditional ecological knowledge. Josh's research has recently been focused in Shishmaref, Alaska, where he has worked with Iñupiaq hunters and elders exploring and documenting ecological knowledge of bearded seals and historic and contemporary hunting practices. James Rogowsky, specialist, egg products, Canadian Food Inspection Agency (CFIA) (Winnipeg, MB) - The CFIA is the arm of Health Canada in charge of safeguarding food, animals and plants. An exclusive behind-the-scenes investigative report taking an in-depth look into alleged local food fraud. In May 2010, Deconstructing Dinner received a tip from a farmer in the West Kootenay region of British Columbia who alleged that a local business who sells eggs to 18 retailers and restaurants and who was marketing their product as being predominantly from their own farm, was not true. According to the tip, the "farm" was not a farm at all, and housed no chickens on the property! As luck would have it, the property on which the business operates was up for sale, and on August 23, 2010, Deconstructing Dinner's Jon Steinman scheduled an appointment! Jeremy Lack, farmer/chairman, Mad Dog Farm / Kootenay Local Agricultural Society (Tarrys, BC) - Mad Dog Farm is a small farm of 28 acres in Tarrys, not far from the City of Castlegar. Run by Jeremy and Nette Lack, and aided by their daughters, two dogs and three cats, the Lacks have a passion for growing, local agriculture and preserving heritage varieties of vegetables and other food crops. The Kootenay Local Agricultural Society is non-profit organization dedicated to the production and promotion of local agriculture and products. They are the owner and certifier of the Kootenay Mountain Grown label. Heide Stang, co-owner, Eggs R Uz (Wynndel, BC) - Eggs R Uz has been operating for many years as a registered egg grading station and supplier of eggs to 18 businesses in the West Kootenay region of British Columbia. Bonny Kavaloff, co-owner, Nature's Den (Rossland, BC) - Bonny and her husband Sid operate this small health store in Rossland, BC. Cindy King, warehouse manager, Kootenay Country Store Co-operative (Nelson, BC) - The Kootenay Co-op is the largest independent member-owned co-operative grocery store in Canada. In business for 35 years, the store prides itself on supporting local producers whenever possible. Matt Lowe, busted backyard chicken enthusiast (Nelson, BC) - In the summer of 2009, Matt Lowe began raising four chickens in his urban backyard. The City of Nelson does not permit such a practice, and in June of 2010, Matt's household received a visit from a Bylaw Enforcement Officer! "Climate Friendly Eating (Conscientious Cooks VIII)"
On this part 8 of our Conscientious Cooks series, we listen in on a really interesting panel discussion hosted in 2008 by the Center for Urban Education about Sustainable Agriculture (or CUESA) located in San Francisco, California. The panel was themed around the concept of Climate Friendly Eating. "The Future of Prison Farms V: Abducted Cows"
Having now devoted four episodes to covering the closure of Canada's prison farms, this Part 5 of our coverage might mark a disappointing chapter for Canadians who have been hoping for a halt to the closures. While all six of these rehabilitative and job-training programs have been progressively dismantled over the past year, the August 9 removal of the dairy herd at Kingston, Ontario's Frontenac Institution is being seen by many as a nail in the coffin. This episode hears from supporters of the prison farms and the steps that the Save Our Prison Farms campaign took since we last covered this issue back in June. We'll learn about the 500-person strong citizen blockade, which attempted to stop the removal of the dairy herd off the property, and we'll learn about what next steps campaign organizers believe are necessary to maintain momentum and possibly turn the campaign into an election issue. Doing so might take advantage of the support of the Liberal Party and the NDP who have both vowed to re-open the farms should they be elected. Andrew McCann Urban Agriculture Kingston (Kingston, ON) - Andrew connects scholarship with community development through his work on global and local food systems. He is turning his masters thesis into a book which visions collaboration between the polarized worlds of "sustainable local food" and "agricultural biotechnology". Cultural and environmental history underpin his writing, as well as his paid work in Kingston's food system where he has been a CSA (Community Support Agriculture) market gardener, lab tech on the Canadian Potato Genome Project, and initiator of the National Farmers' Union's Food Down the Road: Toward a Sustainable Local Food System for Kingston and Countryside. He recently helped found the Kingston Urban Agriculture Action Committee which has been working with the City of Kingston to develop a progressive municipal policy on community gardens and urban farming. Andrew has also instructed Sustainable and Local Food for all Canadians - an on-line distance education course offered by St. Lawrence College. Aric McBay farmer Root Radical Community Shared Agriculture (Howe Island, ON) - Beyond operating a small farm and CSA with his partner, Aric has also authored a number of books including Peak Oil Survival: Preparation for Life after Gridcrash. He's the co-author of What We Leave Behind which he collaborated on with Derrick Jensen and he also co-authored the soon-to-be-released Deep Green Resistance: Strategy to Save the Planet - also a collaboration with Derrick Jensen and Lierre Keith. Dianne Dowling - Farmer Dowling Farm (Howe Island, ON) - Dianne farms with her husband Peter on Howe Island - located in the entrance to the St. Lawrence River. The dairy farm is also home to a vegetable CSA operated by their daughter and her partner. Dianne is the Vice-President of the National Farmers Union of Ontario's Local 316, representing farmers in Frontenac and Lennox-Addington counties and the city of Kingston. "The Erosion of Civilizations (w/David Montgomery & Ronald Wright)"
Deconstructing Dinner has recently been reflecting on the model of agriculture itself as the primary source through which most people on earth access their food. From our exploration of ethnobiology to recent topics on permaculture, it's clear that there are other models available, which, for some people are a substitute for agriculture, and for others, complementary practices. But what within that dependence on agriculture are we all dependent upon? Multinational corporations? The chain grocery store? Perhaps the microwave!? Well behind those dependencies, which are precarious at best, is a more deeply rooted dependence... soil - a dependence of which its once-deep roots have demonstrated over time to have become progressively shallower as 'modern' agricultural practices deplete soil depth and nutrients. On this broadcast, Deconstructing Dinner features voices of researchers who have explored the evolution of agriculture and soil alongside civilization. David Montgomery, professor, Earth & Space Sciences, University of Washington (Seattle, WA) - David is the author of the 2008 book "Dirt: The Erosion of Civilizations" (UC Press). The book explores the idea that we are and have long been using up Earth's soil. Once bare of protective vegetation and exposed to wind and rain, cultivated soils erode bit by bit, slowly enough to be ignored in a single lifetime but fast enough over centuries to limit the lifespan of civilizations. At the University of Washingotn, David studies the evolution of topography and the influence of geomorphological processes on ecological systems and human societies. He received his B.S. in geology at Stanford University (1984) and his Ph.D. in geomorphology from UC Berkeley (1991). David was hosted at Oregon State University in July 2009 by PAGES and was later interviewed by Tom Allen of KBCS. Ronald Wright, author, A Short History of Progress, (Salt Spring Island, BC) - Ronald Wright is a novelist, historian, and essayist, and has won prizes in all three genres, and is published in ten languages. Ronald was the 2004 Massey Lecturer - a presitigious annual public event in Canada, for which he presented A Short History of Progress. One of his more recent works is "What is America: A Short History of the New World Order". He was born in England, educated at Cambridge, and now lives in British Columbia, Canada. "Are Agricultural Systems Sustainable? (Toby Hemenway on Permaculture)"
Much of the content of Deconstructing Dinner revolves primarily around the practice of agriculture; from examining the downsides and challenges of current agricultural systems to the opportunities and alternatives to those challenges. However, most of those alternatives that we examine are 'agri'cultural alternatives, and so from time to time it's important to step back and deconstruct that very focus... asking the question; "Are 'agri'cultural alternatives an adequate response if they're rooted within that same 'agri'cultural box"? On past episodes when this question has been raised, we've often arrived at the subject of permaculture - creating systems that mimic natural ecosystems while providing for human needs. One of the outspoken voices advocating for permacultural systems in North America is Toby Hemenway - the author of Gaia's Garden: A Guide to Home Scale Permaculture (Chelsea Green, 2009). On this episode we listen to a talk Toby delivered in February 2010 when he suggested that 'sustainable agriculture' might very well be a misnomer. He reflected on the rise and fall of past civilizations that help answer the question... "how 'sustainable' is agriculture?" Toby Hemenway, author, Gaia's Garden: A Guide to Home-Scale Permaculture (Portland, OR) - Toby Hemenway is the author of the first major North American book on permaculture, Gaia's Garden: A Guide to Home-Scale Permaculture. He's an adjunct professor at Portland State University and a Scholar in Residence at Pacific University. Toby and his wife spent 10 years creating a rural permaculture site in southern Oregon. He was associate editor of Permaculture Activist between 1999 and 2004 and he now works on developing urban sustainability resources in Portland. For many people, it would be quite welcoming advice to learn that drinking beer could save the world from perhaps an unpredictable changing climate, from pollution, from corporate-driven political agendas, from declining levels of happiness, from increasing levels of stress, from gender inequality, from families and relationships falling apart and from communities that have lost their sense of community. That might be a lot to ask from a simple pint of beer but author Christopher O'Brien places those questions on the 'bar' so to speak in his book "Fermenting Revolution: How to Drink Beer and Save the World". The book was released in 2006 by British Columbia's New Society Publishers and Deconstructing Dinner spoke with Christopher in March 2007. How do food and agricultural issues make their way into educational settings? On this episode of Deconstructing Dinner in Our Schools, we hear from 10-year old Kodiak Morasky who chose a very unique topic to present to his grade 4 classmates. Kodiak was introduced to the world of factory animal farms through the on-line animated series of short films known as The Meatrix. The film had a profound impact on Kodiak, and we listen in on his in-class presentation. Upon learning of the horrific stories coming out of North America's factory farms, we hear one child ask, "can I sue the government"? Christopher O'Brien - author, Fermenting Revolution (Silver Spring, MD) - When not writing books, Author Christopher O'Brien is the Director of Sustainability at American University in Washington D.C. Prior to his role there, he worked with The Center for a New American Dream as Director of the Responsible Purchasing Network and he is also part-owner of the Seven Bridges Co-operative - an exclusive supplier of organic beer making supplies. Kodiak Morasky, student, Blewett Elementary School (Blewett, BC) - Kodiak's 10 years of age shouldn't fool you. He is deeply concerned with the state of Canada's food supply. His concerns include factory animal farms, genetic engineering and chemical pesticides among others. He is passionate about sharing this information with his friends and classmates. "Vancouver's Backyard Chickens II / Bucky Buckaw"
The second of a two-part feature on the City of Vancouver's multi-year process to approve backyard chickens. Because of the many similar debates underway within city councils across the country, this focus on Vancouver's efforts looks back over the past few years to track just how this process first began and how it evolved from there. Perhaps other hopeful or illegal backyard chickeners can glean some pointers from Vancouver's efforts. Among the many voices heard on this part II of our coverage is some of the opposition to the proposed bylaw change voiced to the city from local animal welfare organizations. Also on the show, two segments of the familiar Bucky Buckaw and his Backyard Chicken Broadcast. Bucky shares his thoughts on why he eats chicken and provides some useful suggestions for using eggshells at home.